Artists in Residence GIVE SOMETHING THAT GLITTERS! Our family tree was planted here over 40 years ago. Since 1973, we’ve grown into one of the oldest and most experienced independent real estate companies in Cape Coral. So we are uniquely qualified to achieve the best results for our clients. Our team is ready to help you with your next Cape Coral home sale or purchase right here in Southwest Florida’s fastest growing city. Results. Attitude. Service. Options. That’s Raso Realty. What you need to know: First step when buying a home: Get preapproved. Don’t waste your time, a realtor’s time, or the time of a motivated seller, have a lender’s preapproval letter. Be in the know: Know how much house you can afford. Don’t live beyond your budget. What credit score do I need: A higher score is always best, however, 620 is typically the minimum that lenders are looking for, through some lenders will go as low as 580. What about down payment: One of the biggest myths is that you need 20% down to purchase a home. You can be financed with as little as 3% down. How long does it take: From start to finish can take approximately 30 days from the time an executed contract is presented to the lender. As a lifelong Florida resident, I have spent almost thirty years helping all types of people become homeowners. The gratitude that my clients have shown me is my greatest reward. My background in mortgage processing, underwriting, servicing and construction allows me to focus on the important details to get your loan closed quickly without surprises. THE TEAM IS HERE TO SERVE YOU. WE LOVE WHAT WE DO! all things creative and hit the town to unleash your own creativity! 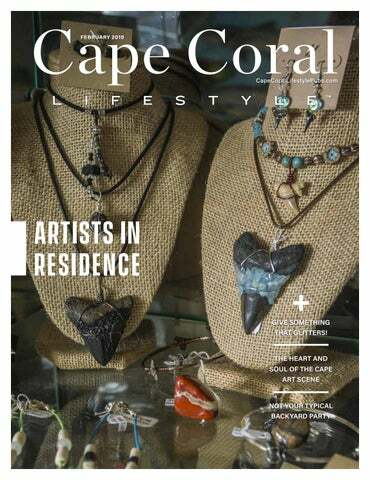 Cape Coral Lifestyle™ is published monthly by Lifestyle Publications LLC. It is distributed via the US Postal Service to some of the Cape Coral areas’ most affluent neighborhoods. Articles and advertisements do not necessarily reflect Lifestyle Publications’ opinions. No portion of this magazine may be reproduced in any form without written consent. Lifestyle Publications does not assume responsibility for statements made by advertisers or editorial contributors. Information in Cape Coral Lifestyle™ is gathered from sources considered to be reliable, but the accuracy of all information cannot be guaranteed. Arts Guide WHERE TO SEE AND EXPERIENCE THE BEST OF THE ARTS IN SOUTHWEST FLORIDA—AND HAVE LOADS OF FUN! WHILE SOUTHWEST FLORIDA MIGHT BE BEST KNOWN FOR SUNSHINE AND BEACH DAYS, IT’S ALSO HOME TO A THRIVING ARTS COMMUNITY. There are plenty of wonderful and creative activities for the entire family to enjoy. Here are some terrific places you’ll want to visit. menu paired with a Broadway-style show. tainment at a reasonable price. and features different exhibits monthly. several major art exhibits each year. Cape. Perfect for a family evening out. cheesesteak—will always be on the menu. HAVE FOUND THEMSELVES RUNNING THE NEWEST HOT SPOT ON CAPE CORAL PARKWAY. “I always vacationed down here, and I knew I wanted to settle down here,” Chris says. But Southwest Florida wasn’t necessarily in Gabe’s plans. “I had my sights set on moving elsewhere, but Chris convinced me to check out Cape Coral,” Gabe says. “I wasn’t totally convinced about Florida at first, but he showed me this spot and I loved the location. I packed up and made the move.” The result of their move? The Backyard Beer Garden, a gastropub-style restaurant that’s quickly gaining local buzz. The menu is also atypical. and being in Cape Coral. “We definitely consider this a gastropub-style menu,” Gabe says. CALL 612.805.9703 Research has proven it is never too late to start exercising to slow the aging process and improve quality of life. RECEIVE 20% OFF YOUR FIRST SESSION Jeri Ann Lundgren, RN, BSN, PHN, CWS, CWCN, CPT is a certified personal trainer and a registered nurse. Her goal is to improve quality of life, physical performance, wellness, and function with personalized evidenced-based exercise approaches. ... A Better Insurance Experience! it wasn’t long before they were too flush with fossils. “You’ll find a lot of teeth on any given day. If you get in a good honey hole, you can find hundreds,” Nikki says. “We just had too many! We had so many we decided to start making the jewelry to sell.” Nikki’s wire-wrapped shark tooth necklaces typically start around $10 and go up from there, but most of her love of her art is the experience collecting the teeth. “It’s so much fun to search for them. These shark teeth are millions of years old, and you never know what you are going to pull up from the river,” she says. “Everyone wants to find the meg, which is the big tooth. It’s really like a treasure hunt.” And by “meg,” Nikki means a tooth from a massive megalodon, the extinct species of shark that lived approximately 23 to 2.6 million years ago. The Grafs usually go to the Peace River every weekend during the winter months to find new shark teeth and fossils and, yes, they have indeed found some of the coveted megalodon teeth there. Nikki’s shark tooth line of jewelry includes necklaces, earrings, bracelets and rings—and she also works with beads, stones, crystals and even uses her husband’s used guitar strings. Just get a boat and go, Simple! ALL THE FUN WITHOUT THE HASSLE A N D E X PEN S E O F OW N ER S H I P! A F F O R DA B L E M O N T H LY D U ES . C H O O S E F R O M L AT E M O D EL B OAT S F O R C R U I S I N G , F I S H I N G O R WAT ER S P O R T S .
“I’ve always loved to write, even as a kid. I’d never published a book before and had no idea how to do it,” Jaclyn says. “I just kept writing, and it eventually worked out. You just have to keep trying.” You can purchase Riches to Rags on Amazon.com, BN.com and other online booksellers. Chef Yveline Mauclerc and her husband, Eric Perez, always planned to move from France to the United States— but they didn’t know exactly where they wanted to live. They set their minds on sunny Florida and spent a few years traveling back and forth from France and Florida looking at cities on the east and west coast of the state, but they really liked what Cape Coral had to offer. So, not only did they move here, but they also opened their delightful French cafe and bakery, My Sweet Art, in May 2017.
party planning, but her real love was being in the kitchen. Lenôtre Paris where she earned a diploma. small cooking classes later this year. My Sweet Art is open for lunch and dinner 11 a.m. to 9 p.m., Tuesday through Saturday. They are closed on Sunday and Monday. S O M E T H I N G G L I T T E R S ! LENORA MARSHALL One of the best priced gulf access homes in Unit 74! Tile in all rooms with the exception of one bedroom. Kitchen has been remodeled with quality cabinets. In addition, the air-conditioner, pool heater, dock canopy and washer and dryer have recently been purchased/ added. If you are looking for that special vacation home or just downsizing to the perfect home in one of the most desirable areas of Cape Coral....come and see this lovely home. You will love the new landscaping! Water and sewer assessments paid! 349,900 Call me to receive a $1000 credit on your closing costs if buying or selling! together and listen to live bands, eat great food and just have fun at this CCBikeNight.com. There will be audience participation in this screening! Food will be provided. Marvel's Black Panther follows T'Challa as he fights for the throne of Wakanda. Rated PG-13. The movie will be shown at 1 p.m. in the Meeting Room. styles and find your next favorite brew. Bonita Brew Fest is a benefit for the Southwest Florida Brew Crafters, a nonprofit organization of homebrewers who are on a mission to help local charities, local families and local organizations in need. For more information, visit BonitaBrewFest.com. SWFL AsiaFest "Year of the Boar"
and ethnic regions from all over Asia. to invite you to Cape Bike Night. 1335 CAPE CORAL PKWY · 28 YEARS IN THE CAPE! Make This Your New Style of Living! This is my idea of sweeping the floors. filled with delightful, colorful creations from local artists. 90 artists sell their whimsical wares there. Of course, just a little more than five years ago, it was only a dream for owner Denise Ahlstrom. Beyond the boutique, Denise and 14 artists—experts in various mediums—teach regular classes. L A N D S C A P E , W I L D L I F E , T R AV E L , C U S T O M I N T E R I O R D E C O R F E AT U R I N G S O U T H W E S T F LO R I D A & B E Y O N D.